We are living in the mountains, surrounded by Bureau of Land Management, and bordered by the Arkansas River. Coyotes, Deer, Bobcats, Bear, Cougars, and Kayakers are regular visiters here. And with that in mind the Hippie Chick Coop was on the drawing table. My husband gutted the van down to the metal, cut out the roof pop up, and built a log cabin style roosting area for the chicks. The engine was removed, and anything else we could part out. Enclosed the drivers area, so I could steer the van without sitting in poop. We move it around so it can double as a chicken tractor. 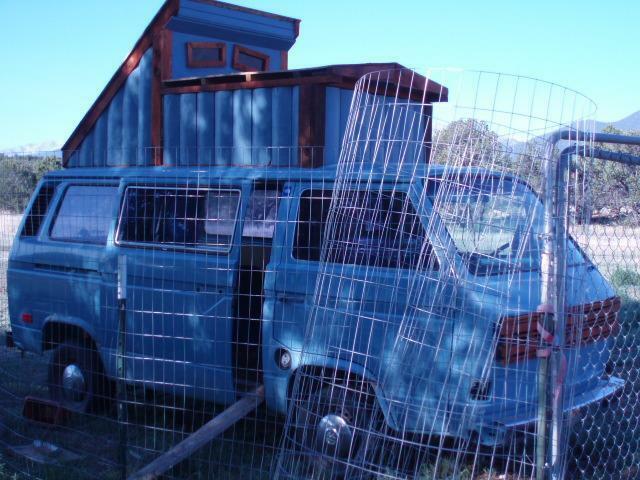 The best part of this VW Hippie Chick Coop is at night I slide the door shut and the chicks are very safe. I can slide the windows open for fresh air. During the day the side door is open but they have an 8ft fence enclosure. Update as of 9/5/10 - the 17 hippie chicks are very comfortable in the van. We have only lost one hen to a Lynx that came through the property. She was outside the fenced area. The winters get very cold here so I have straw about a foot deep for warmth. The ladies prefer to use a cat box for laying thier eggs over the nesting boxes built for them. And they lay all the eggs in one box. Easy for me to collect but I don't think that is thier real reason. We got the idea off your web site. Another member had done a coop from a car cut in half.